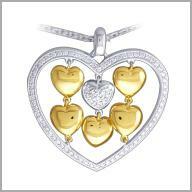 14K White and yellow Gold Diamond Heart Pendant w/ Chain 0.7800 ct of diamonds. Layer your look with a luminous design you'll always adore. This heart pendant is crafted in polished 14K white and yellow gold, and features 78 round full cut diamonds in prongs settings. 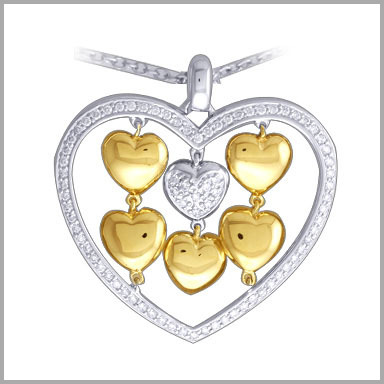 A total of five yellow high polish hearts, alternating with a white gold and diamonds heart, in a sweet design that embodies the concept of love. The total diamond weight is approximately 0.78ct with a color of G-H and a clarity of SI. It measures 1-1/2" x 1-3/8" and includes an 17" rolo chain with lobster claw.